RLI was designed to incorporate best practice in reading and language teaching and interventions for all children with best practice in teaching for children with Down syndrome. 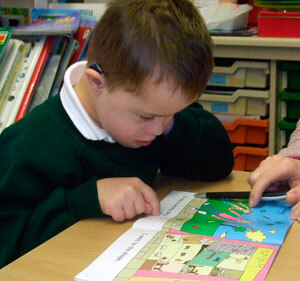 RLI builds on previous work on reading and language interventions at The Center for Reading and Language at the University of York[ 2] by adapting teaching techniques found to be beneficial for other learners to meet the learning needs of children with Down syndrome. There is good evidence that effective reading interventions should combine sight word learning with the training in awareness of sounds in words and the links between letters and sounds, in the context of book reading. [ 3] Previous research has also indicated that this approach could be beneficial for children with Down syndrome. [ 4] However, children experiencing both reading difficulties and delayed spoken language do not always benefit from this type of intervention. Research also suggests that a combined reading and language intervention can be more effective for these children[ 5] and that language teaching activities should demonstrate the meaning of a word as it is used in sentences and in different contexts. The reading strand combines training in letter-sound knowledge, phoneme awareness and the application of these to reading and spelling (phonics), and sight word learning, in the context of book reading. The language strand teaches vocabulary, utilizing visual approaches to introduce and reinforce the meaning of new words in a variety of different contexts, and practicing speaking and writing using newly taught and learned vocabulary. The reading strand targets foundational reading skills and is suitable for beginning readers (those with little or no reading ability) through to those with word reading ages up to 8 years. For children with word reading ages exceeding 8 years (those who have mastered word reading and phonics), the focus of literacy teaching will be on reading comprehension, spelling and expressing themselves in spoken and written language. The language strand can be adapted for children with a wide range of language skills. Children with Down syndrome usually learn and progress more slowly than most other children therefore their development tends to be delayed in relation to chronological age. However, not all areas of development are equally affected. There is a specific pattern of cognitive and behavioral features that are observed among children with Down syndrome that differs from that seen in typically developing children and children with other causes of intellectual disability. [ 7] We refer to this pattern of characteristic strengths and weaknesses as a 'developmental profile'. RLI is designed to target some of the specific difficulties experienced by children with Down syndrome and adapts teaching techniques to build on the children's relative strengths. Expressive language is one example of an area of particular difficulty. [ 6] Children with Down syndrome show specific delays in learning to use spoken language (relative to their non-verbal understanding). Almost every child will have expressive language that is delayed relative to their language comprehension. The children experience two types of expressive difficulty - delay in mastering sentence structures and grammar, and specific difficulties in developing clear speech production. The gap between the children's understanding and their ability to express themselves is a cause of much frustration and can sometimes lead to behavior problems. It can also result in the children's cognitive abilities being underestimated. Language delay also leads to cognitive delay as much human learning is through language and language is internalized for thinking, remembering and self-organization. Verbal short-term memory is another example of a particular weakness. [ 8] The ability of children with Down syndrome to hold and process verbal information is not as good as their ability to hold and process visual information. These verbal short-term memory problems make it more difficult to learn new words and sentences. They also make it more difficult to process spoken language and this can adversely affect learning in the classroom. Word reading is an example of a relative strength. Many children with Down syndrome can develop reading abilities in advance of what might be expected for their cognitive and language levels. [ 9] Reading makes an important contribution to vocabulary and language development for all children and it may be particularly beneficial for children with Down syndrome, given their specific language delays. Children with Down syndrome often find mastering phonics more difficult than other children and their phonics skills lag behind their word reading skills. Researchers have drawn attention to the tendency for children with Down syndrome to show a particular learning style. This learning style is said to emerge from the interaction between their good social understanding but less good learning abilities. [ 7] The children show less good problem solving skills when faced with learning tasks from as early as 2 years of age. They are less likely to ask an adult to help them succeed with the task but more likely to use their good social skills to distract the adult into a social game. This means that they avoid the task, do not learn how to solve it and expect to fail next time they see it. By the time the children are in the classroom this may have become a pattern. The children have become good at avoiding learning situations because they expect to fail and their avoiding behaviors are then seen as behavior problems. Teaching programs should take account of these issues and offer learning activities that are varied and attractive to the child. Teaching approaches should also be planned to ensure success and teachers need to be aware that they should not respond to children's attempts to distract them from tasks. The language and short term memory difficulties of children with Down syndrome make understanding what they can read increasingly challenging. DSE is continuing research into effective interventions for reading comprehension. Although children with Down syndrome share some common characteristics, all children are individuals and the range of ability observed among children with Down syndrome varies widely. The teaching program is therefore designed to be tailored to meet the needs of individual students through an initial assessment process, and through ongoing assessments and record keeping. Books are introduced to match each student's abilities according to a fine grading of text difficulty in order to build confidence and steadily introduce new words and more complex grammar. New vocabulary, including nouns, verbs, adjectives and prepositions, is taught in themes. Themes can be chosen to link to curriculum topics or areas of personal interest. The intervention includes a reading strand and a language strand, each of which includes several components ( Figure 1). Daily one-to-one teaching sessions are expected to last 40 minutes (either as a single 40 minute or two 20 minute sessions). Teaching sessions follow a five day cycle, with new content taught on days 1-4, and revision and consolidation on day 5. The intervention follows a prescribed framework within which content and teaching are tailored to meet individual needs. The reading strand teaches phonics (letter-sound knowledge, phoneme awareness and the application of these to reading and spelling) and sight word learning, in the context of book reading. The language strand teaches vocabulary by exposing students to new words many times and in different contexts. Taught vocabulary includes nouns, verbs, adjectives and prepositions, and is grouped in themes to support the linking of knowledge areas and word meanings. The intervention includes assessment and record keeping tools and is designed to be adapted to individual children's abilities and rates of progress.